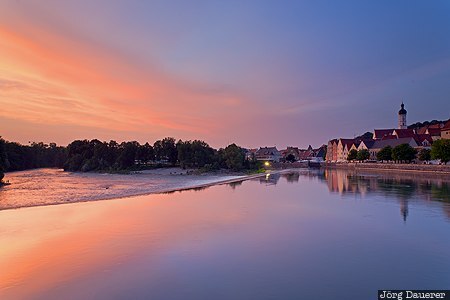 A colorful sunset over Landsberg am Lech and its reflexions in the calm dammed part of the river Lech. Landsberg am Lech is in the western part of Upper Bavaria (Oberbayern) in the south of Bavaria, Germany. This photo was taken in the evening of a hot and sunny day in July of 2015. This photo was taken with a digital camera.